Verdict: This is how a “grown ups” film should be. Enough Said is a brilliantly written, funny, emotionally engaging and thoroughly well performed romance comedy. Despite its rather familiar premise, director-writer of the film Nicole Holofcener managed to pull it off with genuine sincerity and realism. It’s a simple but detailed, no teeny-whiny tale of how a woman could fall for a physically unattractive stranger, how the close-to-middle-age divorced parents cope with their kids growing up, and how perception of another could affect a wonderful relationship. The dating process and dialogues of the characters feel so real that I’m convinced that this is how it could be like for most Americans who’re old and “still searching”. The main actor and actress don’t look very attractive, but that’s the whole point. If you’re a younger audience, you might find this movie highly unconventional, and probably boring. Sorry kids, you can have your Twilight nonsense, but this one’s for the grownups. Second opinion: My girlfriend liked the movie a lot, saying that it seems realistic and sweet, nothing fancy. 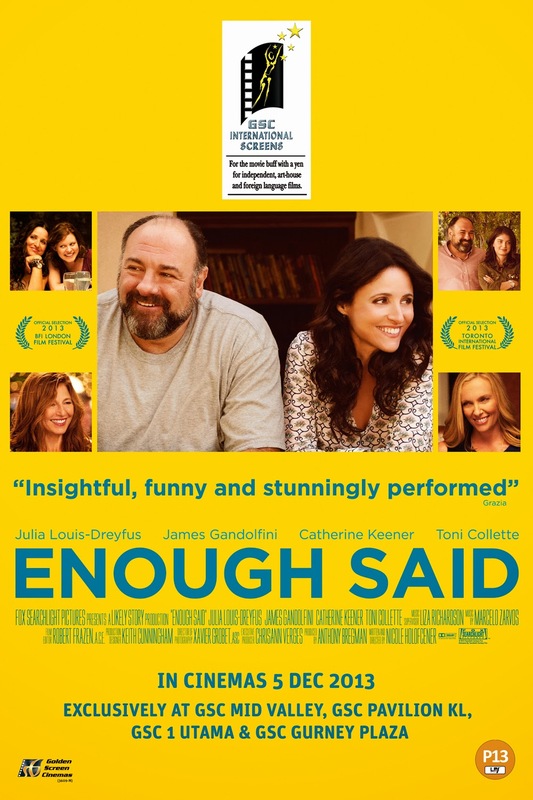 The part where Albert (James Gandolfini) and his daughter walks into the home of his ex-wife Marianne (Catherine Keener) while his now-girlfriend Eva (Julia Louis-Dreyfus) is there, realising that Eva has known Marianne the whole time, allowing his ex-wife to poison their relationship with the sharing of her negative experiences with him. Eva panics and tries to lie her way out of it but only digs a even deeper hole for herself, with each of her words gradually killing their relationship. This is scene is so effective that I actually find it very painful to watch. Especially when it’s so well acted out. 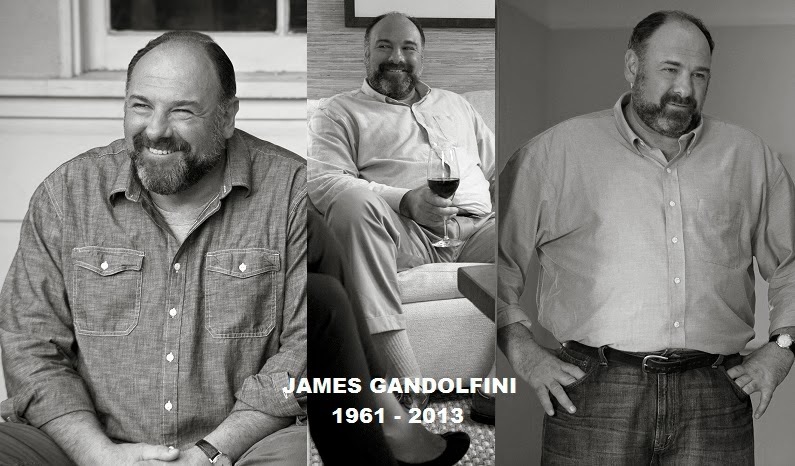 Gandolfini’s expression of devastation, anger and disappointment is just poignantly heartbreaking. Malaysian marketing for Enough Said: I didn’t notice any sort of local advertising or marketing done for this film by 20th Century Fox Malaysia, but understandable since it’s under Fox Searchlight Pictures (distributes independent films only) but it’s not even mentioned on the local distributor’s Facebook Page. None of its trailers were shown at the cinema, heck, I don’t even remember seeing its poster around. If I wasn’t a movie blogger, I bet I wouldn’t have known about this movie unless I’m a great big fan of the actors. However, it’s good to see that a niche, not-easy-to-sell-unless-nominated-for-big-awards film like this being released here before the award season nominees are announced (and voila, free marketing for the films). Although, I do feel that they should give these greater-than-the-usual-shits more exposure otherwise majority of Malaysian moviegoers’ taste in movies are never going to change… unless, of course, that’s what they want. I’ve said enough. Malaysian censorship: I believe nothing was cut at the media screening. To pay to watch? If you’re on a date, it’d be a great choice for a movie outing. Yeah, the Soprano died of heart attack before the official release of this film.